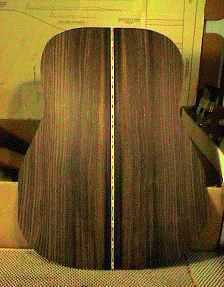 This is the back, after I have glued the two halves together, with the back inlay strip sandwiched in-between. Before gluing, I had jointed the inner edges of the two halves, using my hand jointer (described on my Jigs page). Then I glued the inlay strip, with Titebond, between the two halves, clamping it from both sides with nails tacked into the workboard at the outer edges of the back halves. 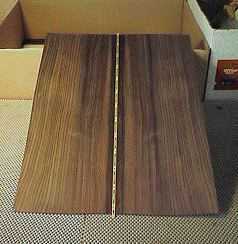 A wood strip protected with waxed paper was clamped over the inlay strip. After the glue has set, I have cut out the shape of the back with my coping saw, making sure to cut at least 1/2" beyond the actual outline of the back. Go to Page 2 of "Building the Back"
Above I am using my go-bar deck to clamp and glue the back reinforcement strip. I have placed wood scraps as cauls between the go-bar sticks and the soft spruce back reinforcement strip. 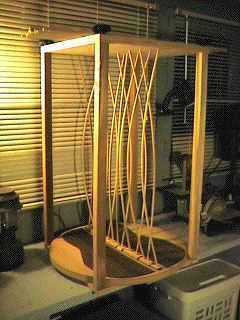 The back is lying upon a curved 15-foot radius dish, to provide the proper arch for the back.